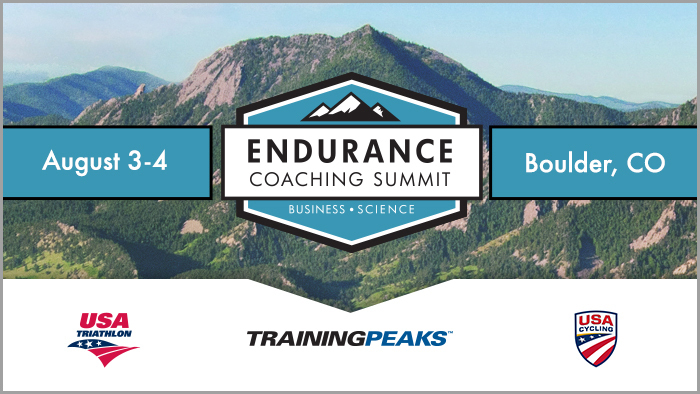 The 2017 Endurance Coaching Summit (ECS) will be held at the University of Colorado on August 3-4 in Boulder, Colo., showcasing a new line-up of coaching, business and psychology experts (as well as a few fan faves from years past). ECS will provide a unique blend of topics for endurance coaches to expand their knowledge, to share their experiences with one another, and to discover new ways to grow their brand and clientele. New for 2017, TrainingPeaks has partnered with USA Triathlon (USAT) and USA Cycling (USAC) to ensure the continued delivery of world class education for coaches and to better collaborate on the needs for coaches in an ever-evolving industry. The 2017 Summit will build off the same successful format that has brought more than 400 coaches from around the world to previous ECS events, including keynote presentations mixed with valuable, small breakout sessions with leaders in the endurance sports industry. Additionally, this year’s summit will offer the highest number of external CEUs of any other event nationwide (12 CEUs for USAT and 15 for USAC), providing coaches an easy way to recertify and network simultaneously. ECS will cover the key business challenges faced by today’s coaches to give them the tools needed to grow their brands, increase their clientele and fine-tune their coaching practices. Attendees will also gain practical insights into the latest research and science-based strategies. Previous speakers include Joe Friel, Dr. Iñigo San Milan, Neal Henderson, Siri Lindley, Dr. Allen Lim, Carrie Cheadle and Jim Miller among others. Continuing a successful partnership in 2016, ECS will include daily, small breakout sessions in partnership with the University of Colorado Sports Medicine and Performance Center. CUSMP’s internationally renowned staff will give coaches insights on topics including cycling and running biomechanics, swim stroke analysis, physiological and metabolic testing and sports nutrition, using the most advanced sports performance technologies. Coaches will also have the opportunity to network with some of the industry’s best coaches, brands and thought leaders, as well as partake in a number of social rides, runs and meet-ups. “If you aspire to learn both cycling and triathlon perspectives, clear your calendar now. There is not another event that compares to what attendees will receive from these two days in Boulder. Add in the opportunity to do some ancillary swimming, biking and running with other attendees, and you have the recipe for a win-win event,” said Tim Yount, COO at USA Triathlon. TrainingPeaks, USA Triathlon and USA Cycling are working together to bring a world-class list of presenters for the 2017 Endurance Coaching Summit. Presenters will bring a background of science-based training methodologies, extensive coaching experience and business expertise. Announcement of the speaker lineup is expected soon and potential attendees can view past presenter lists and register now by visiting the ECS website.